Hi there, friends and future friends! Surprised to see another post so soon! So am I had, but Cheer Up! premiered last night and I had the time to get it done so let's go for it. Also I have confirmed that I will be joining the DramaFever Drama Club for this drama, so make sure to stay tuned for that as well. I'd expect our first post by the end of the week but I'll let you know. 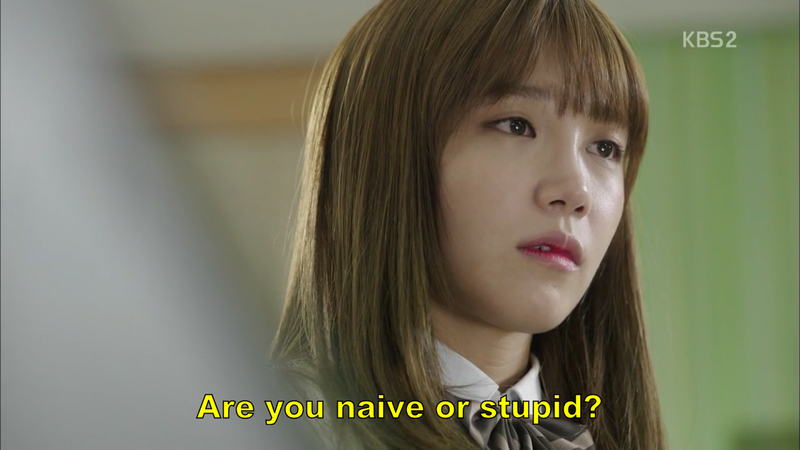 Our drama starts as we meet Yeon Doo played by the effervescent Eun Ji. I am a huge Eun Ji fan and if I'm being honest she's why I decided to cover this particular drama. The plot had zero to do with it and I'm not sure I'd have ever watched it if she wasn't it in, but as it is I'm glad she is because I'm liking the chemistry and characters I'm seeing so far. So Yeon Doo is placed 196 out of the 200 students in her class and she along with the other so called “bottom-feeders” of the school are part of a dance club called “Real Kings”. While in all other parts of the school they get mocked and sneered at for being stupid, in Real Kings they dance their stress away and have fun together. So…almost like Glee then? Lol. Unfortunately, their club space is right next to the club room for Baekho, the school cheer team composed of the top students in the school. Their club exists in name only and they do nothing but study with their time and space. So those in Baekho find the noise coming from the Real Kings room distracting and disruptive to their studies and cut the power to the Real Kings’ room. This creates conflict between the two clubs. Real Kings generates their own electricity and tries to drown out Baekho who tries to do the same in return with classical music. Eventually Real Kings’ radio blows out and they decide to bring the conflict to Baekho face to face. Yeon Doo faces off against Kim Yeol, the arrogant but charming leader of Baekho. Right from the start I sense a lot of romantic tension between these two. I don’t even know if this is where the drama is going or not, but I don’t care. I totally ship it. I cannot measure on a chart how much chemistry these two have. Meanwhile, a group of parents are meeting with the principals and teachers and have questions about the clubs, saying they heard one of them was disruptive. The principal says if a club is disruptive they will ban them without question and then proceeds to lead the parents to the club area. As the conflict escalates between Baekho and Real Kings, one of the members of Baekho gets a text from her mother, telling her that they’re on their way and to make sure not to get into trouble. The girl, although in Baekho, looks sympathetic to Yeon Doo in the conflict. I had an inkling in this scene that they might be friends. Eventually, the argument between the two groups escalates to the point where Yeon Doo decides it needs to get physical and tries to incite Yeon Doo to hit her while the rest of her crew goes at the members of Baekho. The homeroom teacher catches the two group fighting right before the principal arrives and breaks them up just in time for the principal and parents to find an empty and peaceful hall when they arrive. Kim Ji Suk plays the homeroom teacher and I absolutely adore him. And his character seems to be the one authority figure that the students seem to somewhat respect. He’s like a magic maker, splitting up the fight in a matter of seconds. 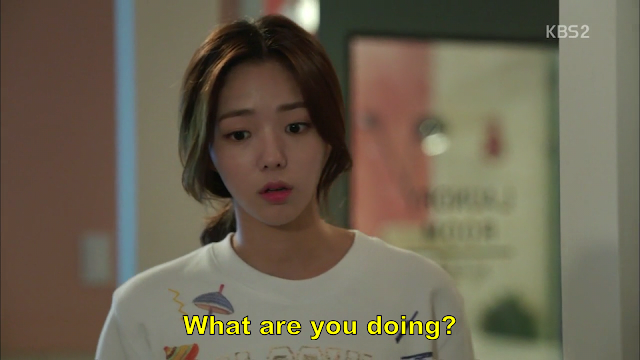 Later, we see Yeon Doo in her room with the sympathetic girl from Baekho, Soo Ah, and it turns out their roommates. So I was right, they are friends. How that’s possible when they’re club are arch rivals is beyond me. Yeon Doo whines about how unfair it is that Baekho gets all the resources and Soo Ah suggests that Yeon Doo meet with Kim Yeol to negotiate a truce. Both Baekho and Real Kings go to their respective club rooms to find them trashed and so Yeon Doo asks Kim Yeol to meet her and proposes a truce. Yeon Doo is having a hard time see what advantage a truce would have for his club, knowing that the principal dislikes Real Kings and is looking for an excuse to get rid of them. Yeon Doo goes to yell at him when the table she’s leaning on gives way and she trips and falls right on top of him. We’re talking seriously sizzling chemistry between the two here and neither moves as they stare at each other. Eventually Kim Yeol smirks and says that either she can move, he can move, or they can just go for it since they’re already in the position. He looks like he’s about to move in for a kiss when we hear the snap of a cell phone camera from the hall outside and the two break apart. We don’t see who took the picture, but we do see them send it to their homeroom teacher as a text saying they want to report inappropriate behavior. The homeroom teacher has proven himself so far to be a pretty laid-back and reasonable guy, unfortunately the other teacher who is the principal’s pet is right over his shoulder when the picture comes in and he sends it to the principal. The next day the Real Kings are greeted by a poster telling them that their club is disbanded for inappropriate conduct in their meeting place along with a picture of Yeon Doo and Kim Yeol as it appears they’re about to get intimate. The Real Kings are furious because they know the picture is not what it looks like and because Baekho isn’t receiving the same treatment. Yeon Doo rushes to the principal’s office to demand an answer, but isn’t let in. Inside, the principal is meeting with Kim Yeol. The principal lets him know she’s letting him off easy since he’s number one in the school and his father is influential. He smirks at the discrepancy of treatment between him and Yeon Doo, but not because he approves. Rather, we see a crack in Kim Yeol and you can tell that he does not approve of the way things work around the school- of the fact that money and influence mean everything. Outside the principals’ office Yeon Doo is waiting and fuming, but Kim Yeol leads her away before she can do anything drastic. She asks him to tell the truth about the fact that they weren’t kissing, since he seems to have been going along with it. He says he doesn’t want to, because it won’t be advantageous to him. Yeon Doo argues that it’s the truth, but he says it doesn’t matter which leaves her even more outraged. Yeon Doo goes to vent to her best friend, Dong Jae, who is on the basketball team. He’s a good basketball player, but will let the other player pass if he thinks he’s going to be hit. Yeon Doo alludes that he has a physical handicap, but that’s all we know so far. I’m sure we’ll find out more about him later. Anyway, while she’s hanging with Dong Jae, she gets a call from one of the other members of Real Kings, and learns that they’re emptying their club room of all their stuff. Yeon Doo rushes over there and begs the principal to give them another chance, but the principal won’t budge. Kim Yeol doesn’t look pleased that the Real Kings are losing their classroom, he even looks like he feels a little bad. Later, he catches Yeon Doo crying up on the roof where their things have been discarded. He asks if she feels that bad to which she responds that of course she does. He turns away and leaves and when she gets up to leave she sees that he has left a post-it on the wall that tells her to make a poster if she feels bad. It would seem that Kim Yeol isn’t completely against her after all. So Yeon Doo and Dong Jae start making posters expressing their outrage when Soo Ah comes in. She says she’s worried the posters won’t make a difference. When she leaves we see her deleting a photo from her phone – the one of Kim Yeol and Yeon Doo in an intimate position. She was the one that tattled. We see a flashback to her being instructed on which classmates she was to get close by some sort of instructor. I’m now sure exactly who Soo Ah is. Is she (or her mom rather) just really focused on getting number 1 or is she some sort of spy? Only time will tell. Yeon Doo posts the posters around school the next day and gets the desired reaction when a member of the education board comes out to do an investigation on the school. However, the principal manages to sweet talk him and as a result all students are grounded for two weeks and forbidden from leaving campus along with having their cell phone rights revoked. 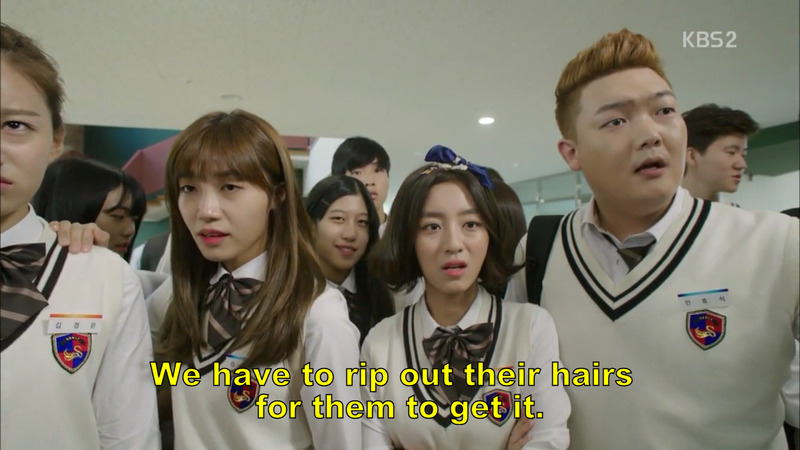 Needless to say the students are not happy, and they blame Yeon Doo since her actions caused the principal to react. 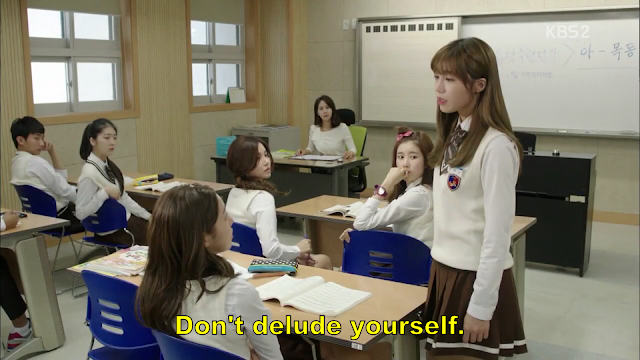 The students chastise her in the lunch room and Soo Ah, who is supposed to be her friend walks away from her. They continue until Kim Yeol tells them to stop, that’s it’s enough. Yeon Doo gets angry and goes to visit the home room teacher to express her frustration and asks him to tell her who sent the picture. He won’t and tells her to go back to class, but after he leaves she takes a look at his phone and sees it was Soo Ah who sent the picture. She is shocked and extremely hurt. She asks Soo Ah why she did it, why she would do that when they’re friends? Soo Ah responds that no one has friends in that school. Soo Ah takes her betrayal a step further by backing out on their group singing project at the last minute and teaming up with other girls leaving Yeon Doo to sing a song alone in front of the class. Despite Eun Ji’s amazing knock-out vocals in real life, Yeon Doo’s song is ruined when she starts to cry out of frustration as Soo Ah looks on with a condensing smirk. Yeon Doo’s anger comes to a boiling point as she stops singing and begins to call out everyone in the class who’s wrong her beginning with Soo Ah for being a backstabber, then to Kim Yeol for not admitting they didn’t kiss, and to the bullies who gave her crap about getting grounded. She accuses the whole school of being cowards who couldn’t stick up for one another. Soo Ah tells her she’s no different and Yeon Doo says that she’s right and that she’s quitting the school so that she can be different. ...next we see Yeon Doo marching back into school and to the Baek Do club room where she tells them she’s applying to join their club. This should get interesting! Hopefully she's going to kick this school into shape because it is full of some shady people. I have a feeling her and Kim Yeol will only grow closer and closer and that she's going to find that he's more on her side than most anyone else. I hope you join me on this journey through this drama. You can keep up with the action by checking out the main page for Cheer Up! on the blog to see my recaps on all available episodes. Until next time, drama on!